Step One: Know when you onions are ready. 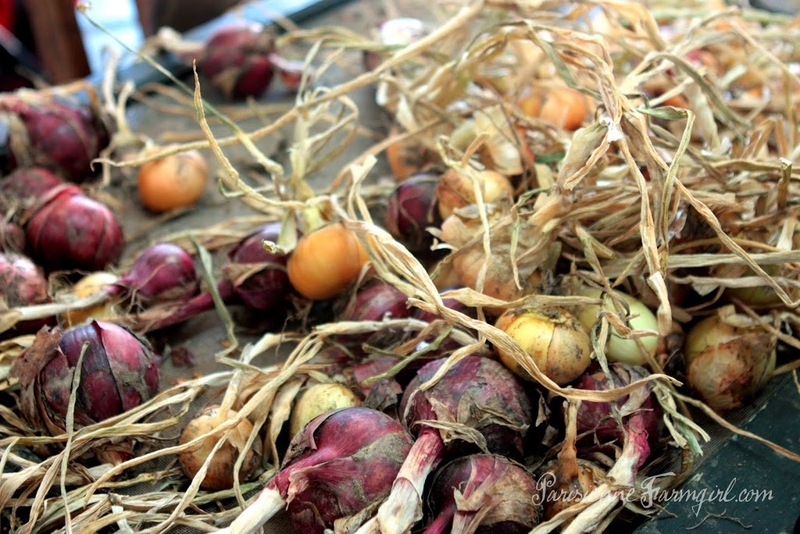 When the tops fall over your onions are ready to be picked. If you’re busy at the time, no worries, they can lay there for quite awhile. Amélie and I just got to ours a couple weeks ago. 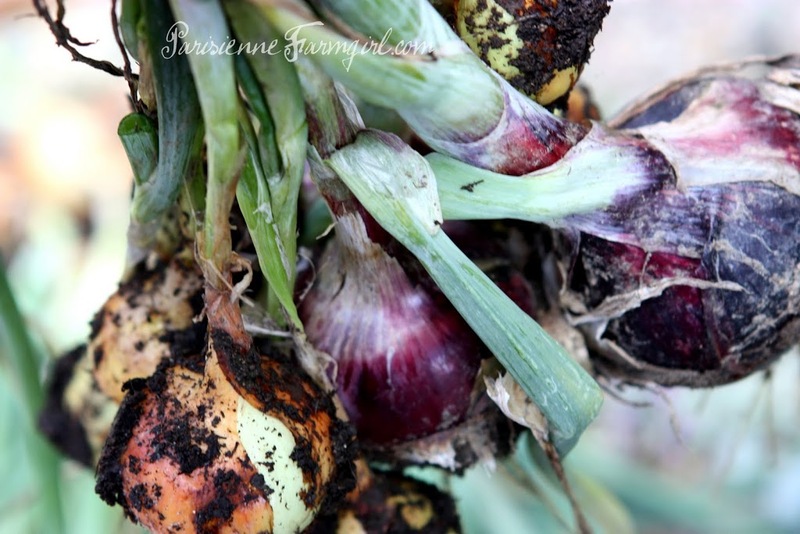 Step Two: Be proud of your harvest – it is what it is! 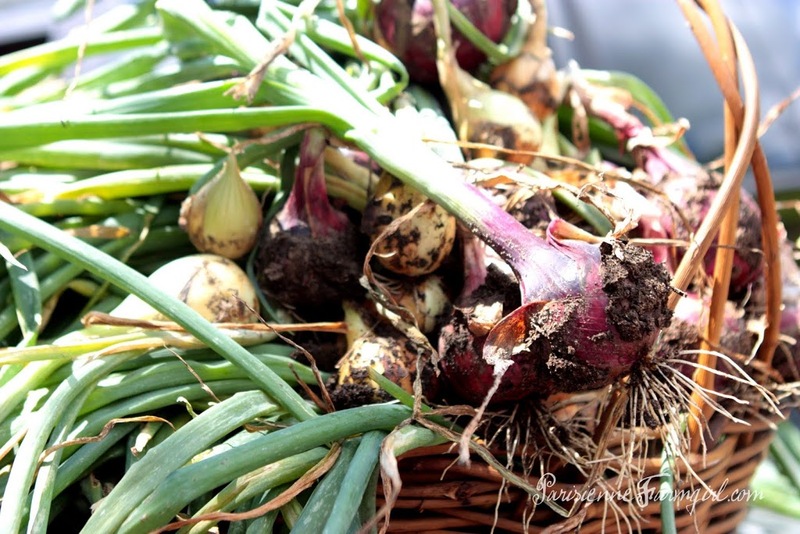 Onions can be ornery to grow. I grew mine from sets this year and most of them grew to a pretty decent size thanks to well tended and amended soil. 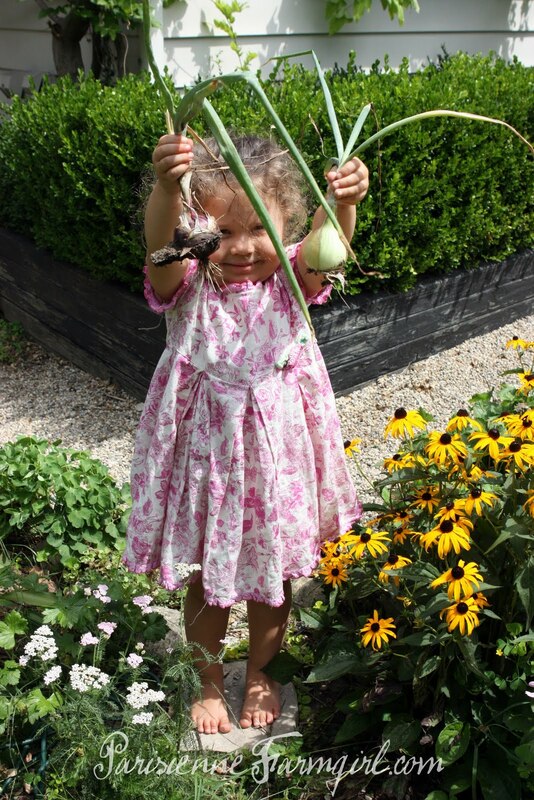 But if you threw late seeds in like my sister did and expected giant onion ring size bulbs by August you’ll probably be disappointed… what do I always say? Gardening is always about next year! Step Three: Well, really, it’s a lack of step. Don’t wash them, just gently brush away big clumps of dirt. Or don’t, it won’t matter in the long run. Step Four: Set your onions in a sunny area with lots of air flow. The point here is to allow the onions to create a couple layers of that papery skin. I use an old screen and a wagon. I pull them out into the sunshine every morning and pull them back in from the rain or overnight dampness every night. Mine sat out a good 10 days before I could find time for them this year. Step Six: Your onions should be papery and dry. Now is a great time to gently rub your hand over them release any really loose paper and any left over clumps of dirt. Step Seven: Take three onions and place as pictured. Tie kitchen twine to the middle onion. Step Eight: Begin to braid the three onions, cross each strand once like the beginning of a braid, using the twine to stableize the structure. Then grab another onion and treat it as you would when you reach for another section of hair when you are french braiding. (If you don’t know how to french braid here is a tutorial. 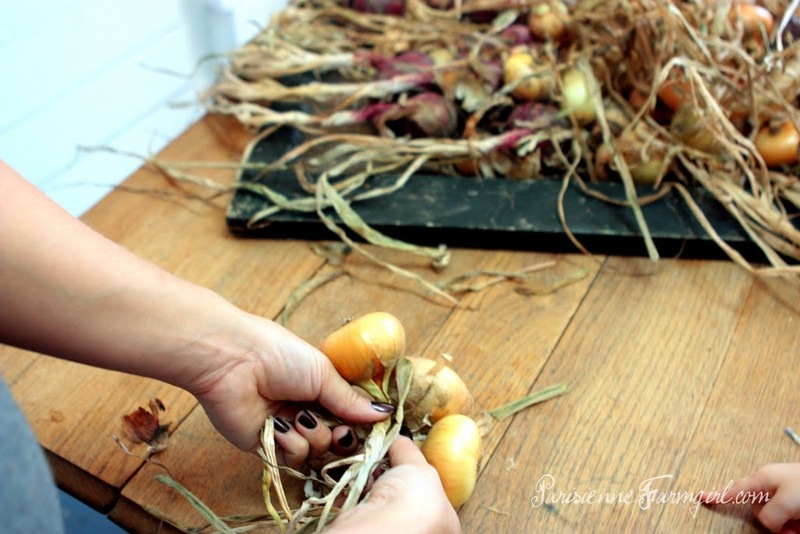 IT’S NOT DIFFICULT but you will need to know how to braid your onions!) Continue to add onions as you would hair. How long you make your onion braids is up to you. This year I did mine short and fat. When you get to the end you can braid your leaves and twine for a few inches and then use the left over twine to tie a knot to secure the braid, then make a loop and knot it to use as a hanger. Step Nine: Store your onions in a cool, dark area. I have had mine last all the way into March! When you need one just cut one from the bottom! This technique can also be used for garlic! How to Dry Hydrangea and Keeping Clean with Herbs! Unless I deliver of course!!! 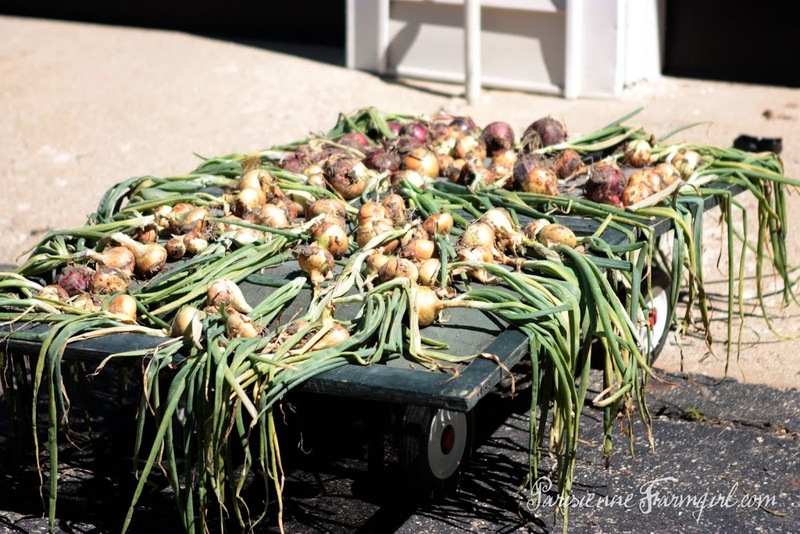 I always used to braid my onions when we had the farm! Thanks for bringing back great memories. I would do this with my girls when they were small. Your little girl is a cutie!! I don’t have any onions this year, but fun to learn how to braid them for in the future. (I DO know how to french braid ~ never thought I would use that for onions or garlic! 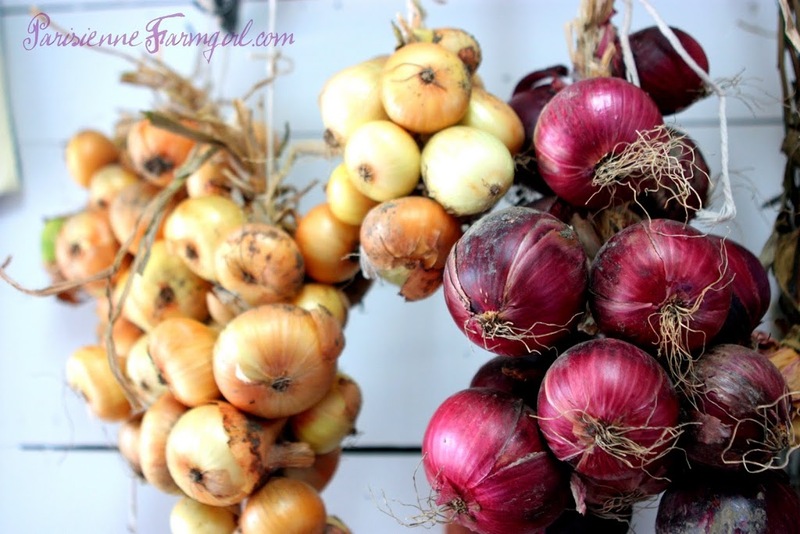 )When you hang the braid, which is the top or bottom ~ where do you start cutting off the first/next onion? At the top where you started or at the bottom? Sorry if this is a dumb question. :~? 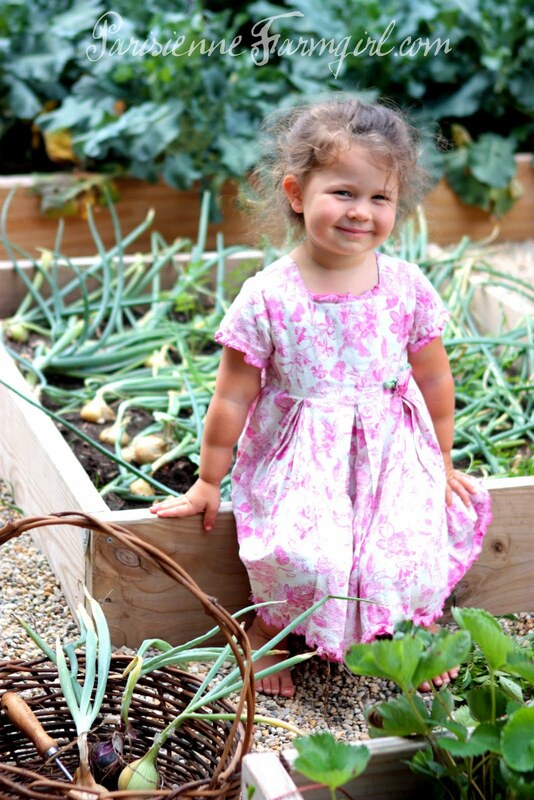 Your little Amelie is just adorable! Praying all goes well and easy with your next delivery! Thank you thank you! I love this and I am so excited to do this. This is my first year with onions and I had no idea I needed to do all that. Yay! How fantastic! 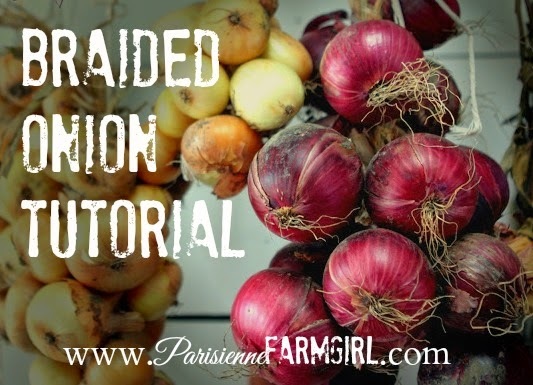 I don’t have onions to braid but I sure did love your tutorial! I can french braid so maybe one day! You made it look so simple and worth a try! I didnt’ realize they’d last that long, into March? THen why do they go bad when you get them from the grocery store? I’ve let that happen maybe a couple of times because of vacation time running into each other and not using them up. 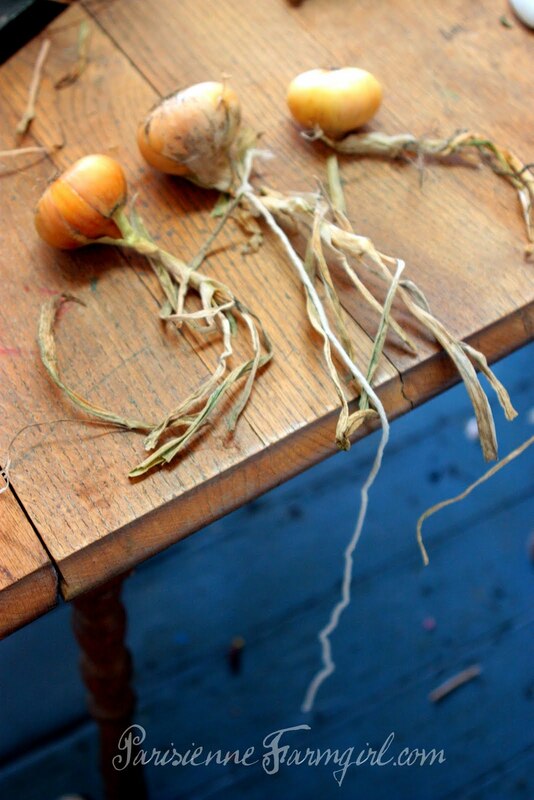 Oh, I am SO going to try braiding my onions this year, it will make me look so…gourmet! And, french braiding is one of the finer pleasures of having a girl with long thick hair…I used to do this all the time with Jamie, and the reverse french braid was especially pretty. Can’t wait to hear about the delivery, and see if it’s a boy or a girl! SO EXCITED! I just picked up an onion braid from the amish farm market. I had no idea they would last so long. I would have grabbed some more. Terrific tutorial! Thanks for sharing. Love your blog! Nice post. It’s the only one That tells you which end to cut onions from once Braided. Thanks again Joe.